Make delicious homemade sausage easy with the Weston Brand Process-Type Collagen Casings. Use these Process-Type Collagen Casings whenever you are making a processed, smoked, pre-cooked, semi-dried or dried sausage, like Snack Sticks, Italian, Polish or Cajun Sausage, Bratwurst or Pepperoni. 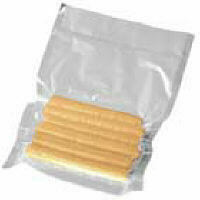 These Collagen Casings have thicker walls than fresh collagen casings for added strength to resist breakage when hung in smokers or dehydrators. They are also designed to allow smoke to permeate the meat to increase the flavors of your sausage. Uniform in size, with no preparation required, the Process-Type Collagen Casings are preferred by professional butchers. Available in three sizes to accommodate from snack sticks to sausage.